Former Azerbaijani President Geidar Aliev, an ex-KGB general and Communist Party chief whose authoritarian ways brought stability to a nation plagued by insurgencies, has died. He was 80. Aliev, who died Friday at the Cleveland Clinic, was admitted to the hospital Aug. 6 with congestive heart failure and kidney problems. Hospital spokesman Cole Hatcher declined to provide details of the cause of death. Aliev was one of a number of Soviet-era leaders who shed their Communist mantles after the Cold War and wrapped themselves in the banner of nationalism. While he voiced support for democratic reforms, he also employed authoritarian ways to maintain his power. His son, Ilham Aliev, succeeded him in office after Oct. 15 presidential elections in what many called the first dynastic handover of power in a former Soviet country. Foreign observers criticized the elections. Ilham Aliev was in Geneva for a U.N. technology summit at the time of his father's death and returned home late Friday night, Azerbaijan's private ANS television reported. He met briefly with members of his Security Council at the airport but left without commenting, ANS said. The station also said Aliev's body was expected to be returned to Azerbaijan on Saturday. State television did not announce the death until Saturday, although it began transmitting somber classical music on Friday, a Soviet-era tradition that often heralded the announcement of a leader's death. 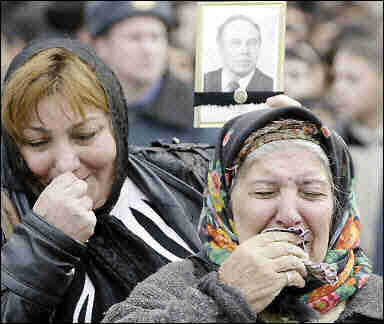 The elder Aliev stifled dissent, censored news media and enforced a blockade on archrival Armenia. But he remained widely popular in Azerbaijan, where he cultivated the image of a wise but stern grandfather and decorated the streets with his portraits and slogans. In Washington, Tahir Taghi-Zadeh, a political officer at the Azerbaijani embassy, described Geidar Aliev's death as "a tragedy ... for the society, for the people and for the country for which President Aliev helped to build after the collapse of the Soviet Union." Aliev "left a lasting political legacy and I think this country is meant to survive and to flourish," Taghi-Zadeh said. Aliev was born in the region of Nakhichevan on May 10, 1923, one of eight children. He said his family was poor ― his father worked as a locomotive driver ― but that all the children received a good education. In the 1940s and 1950s, Aliev rose through the ranks of the Soviet secret police under dictator Josef Stalin and became head of the Azerbaijani KGB in 1967. 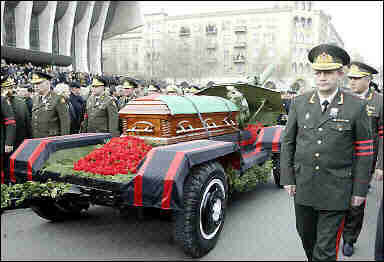 He was a protege of former Soviet leader Leonid Brezhnev. From 1969 to 1982, he ran Azerbaijan as the republic's Communist Party leader. He became a candidate member of the national party's Politburo in 1976 and a full member in 1982, reaching the pinnacle of Soviet power. When Mikhail Gorbachev took over in 1985, Aliev became an opponent of reform along with other Brezhnev-era leaders. Gorbachev managed to oust him in 1987 on allegations of cronyism, nepotism and high living at party expense. Aliev returned to his native Nakhichevan, an autonomous region on the border with Iran and Turkey that is separated from the rest of the nation by a long strip of Armenian territory. In 1990 he became chairman of Nakhichevan's legislature and deputy chairman of the national legislature. Two years earlier, fighting had broken out in Nagorno-Karabakh, an ethnic Armenian enclave inside Azerbaijan. Armenian fighters drove Azerbaijani forces from the disputed region and seized nearby areas of Azerbaijan proper. The war left 30,000 dead and turned 1 million Azerbaijanis into refugees in their own country. In 1993, humiliated by their battlefield losses, some 45,000 soldiers seized control over about half the country and demanded the ouster of President Abulfaz Elchibey. Aliev became parliament speaker in a government reshuffle forced by the rebels. Elchibey fled, and Aliev took his place. "If I were not here (in 1993), I do not know what would have happened with the republic," Aliev later told the Russian newspaper Komsomolskaya Pravda. "After all, no one was found besides me who could save the people. ... Azerbaijan would have split into several parts." Aliev signed a cease-fire on Nagorno-Karabakh in 1994, which ended the fighting but left the enclave firmly in ethnic Armenians' hands. He set about asserting control over Azerbaijan, suppressing several attempted coups and a separatist movement in the south. He also launched economic reforms, including a rapid privatization program beginning in 1996, and he signed deals with international investors to develop oil fields along the Caspian Sea coast. The oil wealth failed to trickle down to ordinary citizens, however, and the standard of living continued to fall throughout his presidency. Under his leadership, predominantly Muslim Azerbaijan had a sometimes prickly relationship with Russia and drew closer to the United States. It volunteered troops to serve as international peacekeepers in Afghanistan, alongside troops from its closest ally, Turkey, and expressed willingness to receive some planes from the U.S.-led forces fighting in Iraq. Aliev tried to restrict the political opposition through legal challenges and intimidation, and his opponents accused him of trying to create a cult of personality. He won easy re-election as president in 1998, but international observers said the two elections he won were heavily rigged. He had declared his intention to run for a third term this year, but many of his critics thought he was actually paving the way for his son Ilham, who heads the state oil company. Aliev had a heart attack in 1987. He underwent bypass surgery at the Cleveland Clinic in April 1999, after Turkish doctors said his heart was working at 25 percent capacity. He also had prostate surgery there last year and a hernia operation in early 2003. 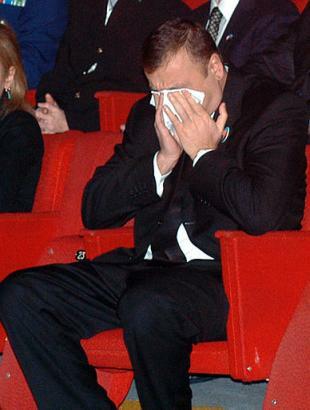 In late April 2003, Aliev collapsed during a live televised speech. Officials initially said the fall, which aides attributed to a sudden drop in blood pressure, caused him to break a rib, but Ilham Aliev later said his father had broken seven ribs. He was flown to a Turkish hospital for nine days in May, part of which he spent in intensive care. Elaborate celebrations planned for his 80th birthday on May 10 were canceled, and Aliev returned to the hospital July 8. Throughout his treatment, Azerbaijani officials insisted he was not seriously ill and would return home soon. He was transferred to the Cleveland Clinic on August 6. After insisting that he still planned to run for re-election, Aliev also had his son's name put on the ballot. He pulled out of the race in October, citing health reasons. His supporters immediately backed his son. Aliev, a widower, is also survived by a daughter and six grandchildren. He is to be buried in a state funeral in Baku on Monday, amid a seven-day mourning period announced by the government on Saturday. +Saddam arrest cheer fades into Iraqi ire at U.S.